So, I'm in the process of slowly but surely upgrading my PC. The only thing left to buy will be the RAM. Regardless, at the moment I'm running a Phenom II x6. I understand that this processor is a bit on the slow side for modern gaming, but I can not for the life of me figure out why I'm getting slowdown on F-Zero GX. Watching my CPU clock it's barely turboing past 2.8 Ghz and even then the utilization is well below 30% per core. The PC itself is staying cool like there's not even a challenge. Do I have something set up wrong, or am I just not getting accurate reads on the CPU usage? Turbo on K10 processors (including the Phenom II) was a bit...broken to say the least. As for CPU utilization, Dolphin itself only really makes heavy use of 2 cores, so it's more likely that you're seeing around 100% utilization on 2 of your cores and nearly 0% utilization on the remaining 4 cores, which can sometimes appear in things like the Task Manager like all 6 of your cores are running at ~30% load. I personally have both a copy of F-Zero GX and a black edition Phenom II quad core, so I could easily check and see if the performance you're seeing is correct...though that's a bit hard to tell if you don't tell me what fps you're getting and where in the game those fps numbers were achieved. Nevertheless, there's always the general stuff like make sure you're using the newest development build of Dolphin, and try using the vulkan renderer as well. I can do a couple of screens if you'd prefer. Basically, I'm only seeing about 30% on any individual thread, though. 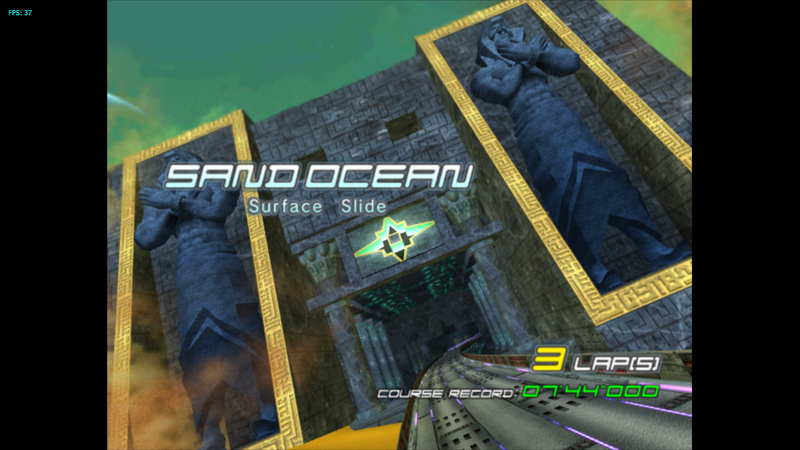 Most games are OK, but F-Zero X does terrible on Sand Ocean. It's unplayable even in time attack mode, and It's running at 35 fps. Normally, I would consider that okay, but when I turn on frame skipping, it's like the game just starts flickering like mad. 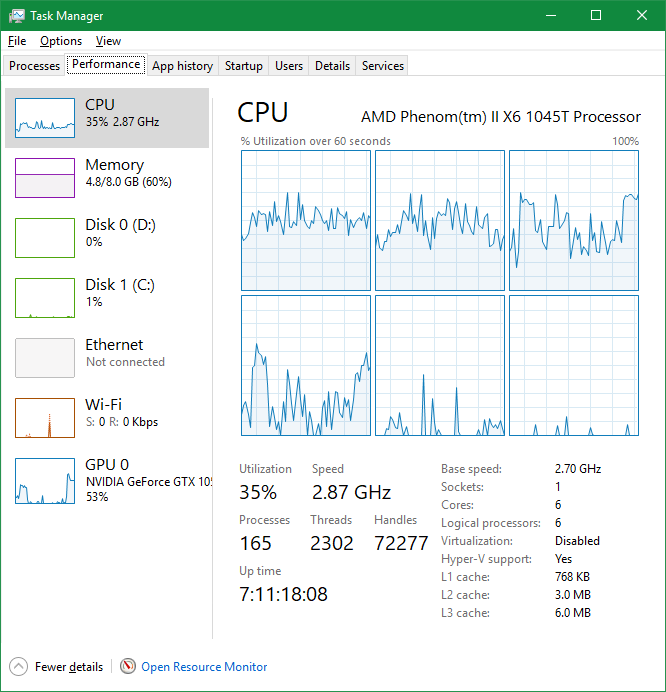 I can't compare just yet as I really should have gone to sleep hours ago, but nevertheless keep in mind what I said about the Windows task manager. Another way to explain it is that, on a quad core CPU, if you have the first 2 cores maxed out and the last 2 cores idling, it can sometime appear that all 4 cores are instead running at 50% load. I also just want to mention that I believe F-Zero GX actually will run at 30fps with normal speed if you can't run the game at 60fps which may be why the frame skipping is causing issues. Well, 50% on any individual thread. Plenty of overhead left. Also, how would I get it to run at 30 FPS? (02-21-2018, 08:45 PM)debeant Wrote: Well, 50% on any individual thread. Plenty of overhead left. Also, how would I get it to run at 30 FPS? No, 50% on any individual core. Keep in mind that windows moves the threads between the cores a few times per second to balance the thermal load. So this looks like two cores are fully utilized. As dolphin uses *up to* two cores, and often waits on the GPU as well, this is a full utilization of your single threaded performance. I fear you just need to get the missing memory. By the way, which version of dolphin are you using? As far as memory, That's a no-go, at least right now. I was just hoping that I was overlooking something, but it seems like I'm not. Bummer. Might look into overclocking, I've got the thermal overhead. Best I can figure is the cooler I've got keeps the temp under 50 C, so I could maybe ramp up to 3.2, maybe 3.5 on every core... maybe. Or I could just wait the two weeks to get the DDR4 ram for my new Mobo and CPU so I can swap that in. Either is an option. Try to update to the current development versions and pick the Vulkan backend. I'll give it a shot and report back with the results. Yeah, that works really good. Now I'm curious, why does that work as well as it does? I thought all the graphics stuff was handled by the GPU. I'm not saying you don't know what you're talking about, I'm asking a genuine question because it doesn't mesh with my personal knowledge base.